Spacious and Comfortable, Private gated location -- a 10 min. flat walk to the Jardin, and close to the Instituto, Juarez Park, and Rosewood. Airport transport and tours available by bilingual American owner, Wonderful staff (cook, maid and gardener) plus complete menus, Hot tub, Pool table, Solarium, Beautiful Courtyard, Gardens, Terraces—This property has it all! This house will truly be an unforgettable experience for you and your party. The property is located in the Historic Centro of the city in one of the most exclusive areas. You will be close to El Jardin with a leisurely 10 minute level walk from your front door. There are excellent restaurants, galleries and shops only two blocks away. Conde Nast continues to rate San Miguel de Allende as one of the top ten destinations. The rental includes a wonderful cook with a large repertoire of Mexican Dishes. (write for Menus) The owner lives on property adjacent to the house, and is available to help with any problems you may have...a distinct advantage over arriving to an empty house with keys and a sheet of instructions! Airport transfers available too! Within a quiet and enclosed community, you arrive at this large colonial house, with impressive carved stone facades and ironwork, a huge outside green area with grass, cactus, avocado, lemon, and pepper trees. Go back along the shaded walk to a very private entrance, where you enter the house with a unique and interesting floor plan; including a sunny formal living room, an impressive foyer, a large formal dining room with seating for eight persons, a spacious and beautiful kitchen with its own large table for informal dining, an arboretum with banana trees, ficus, bougainvillea, a 100 year-old pool table, plus a very comfortable adjoining den. Walk up the impressive stone 'flying stairway' past a 20 foot cathedral window looking into a patio with a flower lined fountain and a beautiful tile-lined spa (easily holding eight persons) with old columns supporting the tile roof. At the top of the stairs admire the cupola and suspended chandelier, walk into the enormous master bedroom and adjoining dressing room and bath. The boveda covering part of the master bedroom is a unique design which lowers the ceiling, giving the feeling of a canopy over the bed. Also at the head of the stairs, you may enter the guest wing of the house, which has a sunny and extremely spacious bedroom, with a similar canopy boveda ceiling, fireplace with gas logs,and comfortable chairs for reading. The guest bath has a shower and is divided into 3 separate sections for the shower, washbasin, and commode. If there are more than 4 people in your party, there is a studio apartment with a queen size bed, TV/DVD, fridge, microwave and nice separate bath available at extra cost. No Children or Pets, please. The entire house is a feast for the senses, with windows, light, and unending details... such as the lima-bean shaped tile bathtub in the master bedroom, the hand painted relief on the large arch spanning the kitchen, beautiful woodwork, stonework, arches, terraces, fountains, fireplaces, beamed ceilings, etc. The home has two Wurlitzer Juke boxes from the 30's and 40's (enjoy the lights but please do not play) a piano, an antique Brunswick solid oak pool table from the 20's, (please DO play! ), Wet Bar, large outdoor grille, and patio furniture for outside dining. There is lots of comfortable furniture for just relaxing both indoors and out. The staff includes a very capable and sweet cook, an upstairs maid who washes and irons linens and personal laundry, (personal laundry can also be left at the full service laundromat one block from the house) gardener, and a gatekeeper. Your locaton is perfect to take advantage of all the activities in this interesting city. Cozy studio apartment is the 3rd bedroom-- available on the premises for additional guests in your party. Secure parking is available. Kayaks available--Owner will transport you to the water and accompany you on a fascinating water tour with abundant bird life. "I feel like a Spanish Contessa"
These were my wife's first words after our host Jack showed us around our living quarters. The VRBO photos are fine, but do not convey the astonishing beauty of the place. We had originally planned to stay only a few days, but Jack said most people find you need 10 days to do it justice. We stayed 10 days. He was right! What made this trip so unique for us was the personal service we received. Our host picked us up at the airport and took us back to the airport. Although an American by birth, he has lived in Mexico over 40 years and is totally bilingual. He took us on tours in San Miguel and several surrounding towns and areas. He took me kayaking in a close-by lake. His cook Dolores and housekeeper Blanca were warm and friendly. The menu choices were many. We followed Jack's recommendations most of the time. My wife is a prolific amateur artist, looking to learn more. The art scene there fascinated her. I was more interested in the history and culture. We went on home tours and walking historical tours. Jack took us on some, and recommended others. There is certainly some truth in one You Tube video we watched pre-trip which described San Miguel de Allende as the "Paris of Mexico". We encourage you to have Jack take you to the near-by city of Guanajuato. See the Diego Rivera Museum, and the hacienda outside the city built in the 1600's by the Spaniards. It is also a perfect place to relax and recuperate from the fast-paced life many of us lead. The 6,500' mountainous altitude makes for low humidity and cool days and nights. What says it all is that this is the only trip we have taken that we were not ready to leave when it was time to go. For the 5th time in 5 years, we had a fabulous stay! We wouldn't keep coming back if that was not the case. Our host was so accommodating, as always, and helped us whenever the need arose. He is well read, and knows a lot of history about the area, and can make many recommendations. The cook made some really delicious recipes for us, and we will be requesting some of the very same next year. The house is clean and very inviting. Thanks to the maid for all she did for us. It's all appreciated. We try to tell all our friends about this place, and hope they will try it out and love it just as we do. Thanks again for a very special vacation & we'll see you next year! Lovely, charming and perfect location! We were a group of 3 couples - all of whom had a wonderful time. The location was ideal. The owner was an outstanding host (in addition to being a great guy) - always available when we had a question. He had terrific tips, information, stories, and the best margaritas either side of the border. We took a couple of side trips with him, which were informative, efficient, colorful and enjoyable. Having a wonderful cook available was a great plus, as well. The property was well kept. My husband and I stayed in the second bedroom in the main house, which suited our needs just fine. Of course, because we were in town, there were church bells and firecrackers at some unusual hours, but this is true of any place in town. This place is a bit more private and tucked away than most in-town spots. I would go there again in a heartbeat and definitely recommend it to others. Our stay at this lovely property was all that I hoped for. I wanted to arrive and be able to walk everywhere and we did. And when we were done for the day, we were ferried home by one of the many available and inexpensive cabs. We arranged be picked up at the airport. Very good idea. He was waiting for us, grabbed our bags and we were safely off. Jack has made it a point to become familiar with the geography, history and social mores of the area. A wonderfull cooked meal was waiting for us when we got to the casa. Delores, la concinera, has a wonderful repertoire which we perused before our arrival. Chicken enchiladas with chile verde, a wonderfully fresh salad, guacamole all topped off by her famous, yes just as good as my mom's apple pie. My traveling companion and I like a slow start in the morning, with plenty of good Mexican coffee. A fresh fruit plate awaited us every morning. Delores made us breakfast most days and served us. Quite special. And the house, we each had our own bedroom. The master is huge, but I was quite happy in the guest bedroom. Lots of privacy, I would open the floor to ceiling windows and a gentle breeze would float in at night. La casa is off the street a couple of blocks in. There is a nice gentleman who opens the gate for residents and he greeted us each day. Our house was quiet and again very private. We had a wonderful upstairs terrace to hang out on and another private patio right outside our kitchen. Jack is right next door if you need him and he would usually knock around the time Delores would arrive at 9:30 and check in on meal plans, anything we needed and any tips for planning our day. He helped me get oriented to the map I had brought and we were off on many adventures. He also escorted us to Guanajuato, the capital of the state of Guanajuato. He is a very capable guide around town and he really has taken the time to know the history, the people and the culture. Barbara and I are studying Spanish and he was very patient with us. He first English speaking, but he has an incredible command of the language. In Guanajuato we went to the Casa Museum of Diego Rivera and he engaged one of the museum guides who provided the backdrop to one of Rivera's very famous murals. We also went to Teatro Juaréz and took the funicular to the top of town for stunning views, a riot of color, all the time, Jack was pointing out the sites. San Miguel, of course is magical: Bellas Artes, Biblioteca, La Fábrica Aurora, outdoor markets. Charming, spacious home with gorgeous Mexican architecture including beautiful, private outdoor courtyard. The owner lives nearby and is attentive to your every request, making trips to the grocery store, recommending restaurants and other cultural activities. The location is ideal- easy walking distance to the Jardin and yet in a very quiet neighborhood next to a park. The cook prepared delicious lunches and dinners for us and always had fresh fruit cut up for us for our breakfast. The house was immaculate thanks to the maid who came during the weekdays. We highly recommend this exceptional property for your next vacation. There are many cultural events to keep you as busy as you want to be in this friendly, picturesque, historical town! We love San Miguel de Allende. We just LOVE this place. It is not only beautiful, but spacious & charming too! It is tucked back in a gated area, but close to everything. We walked to the Jardine nearly every day (or taxis are very affordable). The cook is a master at preparing tasty dishes, and breakfast on the courtyard is a real treat. The house and bedrooms are cleaned every day by a wonderful lady, and it's so nice to have our bed made for us (I could get spoiled). Just can't say enough good things about the property owner. He's a real bonus. This is our 4th year in a row, and we've already booked for 2018. Can't say that about any other place we've ever been! 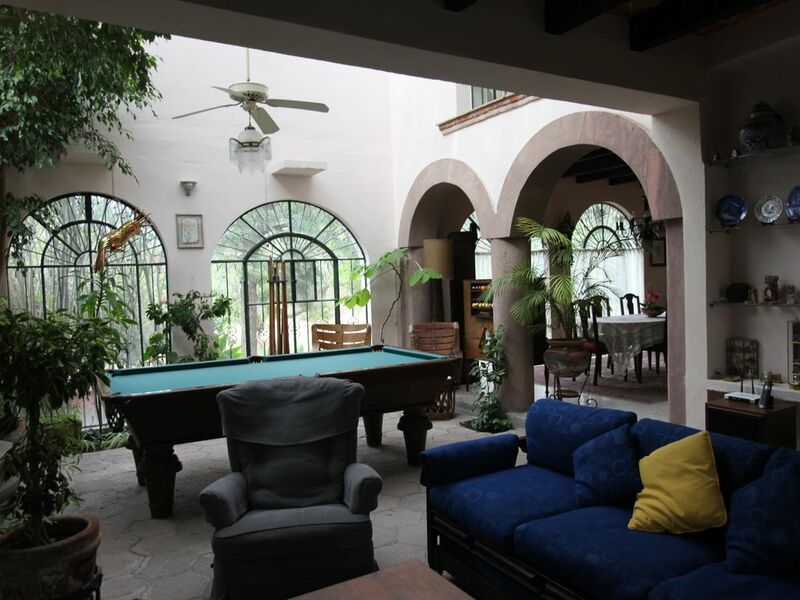 So if you're looking for a fabulous place to stay in San Miguel, you won't be disappointed here!!! No damage deposit through the HomeAway Payment Service is required. But, since this is really a "full service stay", I do require a $500.00 up front "expense" and damage deposit (payable by personal check on arrival) to cover any transportation/day trips we do for you, as well as beverages and groceries purchased for the preparation of your meals. Any portion not used will be refunded to you at check out. The weekly rate is based on occupancy by 2 persons. Rate for 2018 will be $1,200/wk for 2 persons-- with $100.00/wk for each additional guest. The main house contains 2 very spacious bedrooms--suitable for up to 4 persons. If you require a 3rd bedroom, the studio apt. (see photos) is available for an additional $200/wk. Maximum occupancy for main house and studio is 6 persons. Maximum weekly rate for 6 persons is $1,600/wk Cancellation Policy: 90 days prior to arrival, 75% of deposit is refunded; 61-90 days, 50% refunded; 31-60 days, 25% refunded. 30 days or less, deposit is forfeited.